I’ll be the first to admit, I never in my wildest dreams thought for one second that Triple H would become a main event attraction, let alone marry Vince McMahon’s only daughter. Boy, was I wrong. Trained by the late legendary , infamous (for removing the ear of fellow competitor, Yukon Eric’s head) WWE Hall of Famer, Walter “Killer” Kowalski, it wasn’t long after a very short stint on the New England independents, that the now defunct, WCW came calling. From the beginning, Helmsley proved himself a true student oh the game (pun intended). Even though he was a contracted worker, you could find H honing his craft at WCW’s training facilities, the Power Plant. It would be here, where Triple H would befriend a veteran of the English carnival circuit, one Mr. William Regal ( I think it’s safe to say that this friendship would benefit Regal years later). After a short time teaming with Regal, with his one year contract up, Helmsley would move on to the “show”, “New York”, Vince McMahon’s WWE. It wasn’t always easy for Helmsley, stuck with an aristocratic American blue blood gimmick, wrestling garbage men and pig farmers. The upside (though, some may say downside) however was that he endeared himself to the most inside faction in pro wrestling history, the Clique . Consisting of Kevin Nash, Scott Hall, Shawn Michaels, and Sean Waltman . The Clique were infamous for their cruel ribs (usually involving feces), the burying of other talent (see Shane Douglas), and only wanting to work with one another, thus securing their main event spots, not to mention heavy paydays. It would only be a year that Hunter ran with the Clique (not withstanding, Shawn Michaels and later Waltman). For, Hall and Nash would be on their way out , down to WCW for less days worked and guaranteed contracts. So it would be in May of 1996, at a house show inside the Mecca of pro wrestling, Madison Square Garden, that H would take on Hall and champ Michaels would battle Nash in a cage (Waltmam wasn’t there). 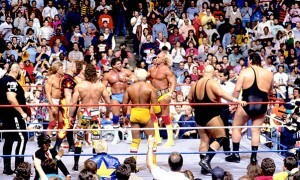 After the cage match, victor Michaels lifted Nash to his feet, while their buddies, Helmsley an Hall ran down to the ring. In what many inside the business would consider a slap in the face, both heels and baby faces alike hugged their final goodbyes . With no way to punish either Hall or Nash, and Michaels their champion, it was Hunter, the low man on the totem pole to feel the brunt of things. For the next six months or so, Helmsley lost what was to be his up to then, literally crowning achievement, the King of the Ring Tournament (ultimately given to a rising star by the name of Steve Austin), while spending his time by looking up at the lights, on a night by night basis. By fall however, Helmsley was Intercontinental Champion. Even after he shed himself of the American blue blood gimmick and created Degeneration X along with his friend and mentor, Shawn Michaels, I still couldn’t help but see him as anything more than HBK’s sidekick and at most an upper mid card talent. Shawn’s retirement after WrestleMania 14 was the best thing that ever could have happened to HHH. He took over the reigns of DX, recruiting a returning Waltman along with Billy Gunn, and the Road Dogg (in the meantime becoming, arguably the most popular faction of all time). But, even then there were doubts in my mind. I remember one RAW in particular where Shawn and the Rock came out and tore into him, Michaels taunting him as mid card for life ( Rock entertaining as ever, referring to Helmsley, as a man who looked like Tarzan, yet wrestled like Jane. The Rock as only he can, ended the segment by half stealing the catch phrases of Hogan, Savage, Flair, and Hart. Find it, you won’t be disappointed ). The match that sticks in my mind that truly brought H to a whole other level, is the ladder match he competed against the Rock at SummerSlam ’98. It was pure brutality, and stepped up both men’s game ( pun still intended ) with the yet to be christened, King of Kings victorious. But what in my mind ( and many others for that matter ) made Triple H into a bonafide main event superstar ( no matter what the man himself may think ) was his street fight with Cactus Jack at the Royal Rumble 2000. With Foley retiring soon thereafter, he is one of the few to selflessly pass the torch. I don’t see any reason to delve into what has happened since, other than I think most of us can agree that the man born Paul Levesque has proved himself a true main eventer, and even more than that a true cerebral assassin. Bill “Halfway” Hamill is a musician, comic and podcast host who hails from Detroit, MI.